She's playing it for laughs while making a stink about some serious issues. 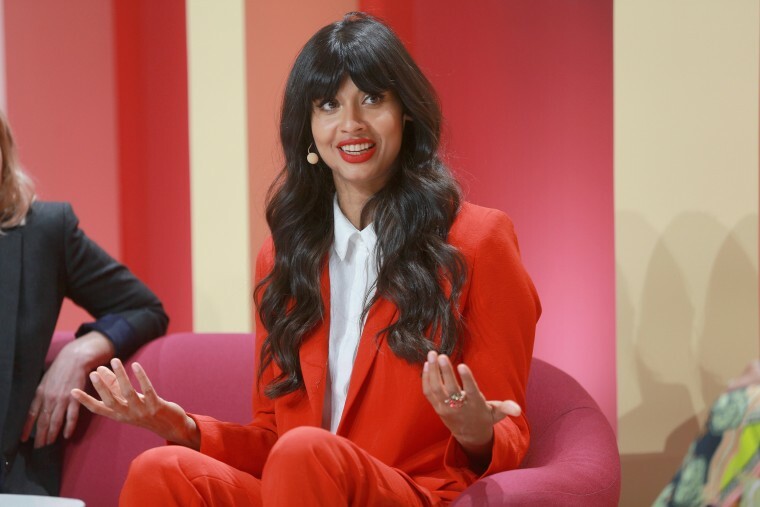 Jameela Jamil, one of the stars of NBC's "The Good Place," has been waging a social media campaign against female celebrities hawking diet products on their social media platforms. In a video that's racked up over 100,000 likes on Twitter and Instagram, Jamil offered an "honest" version of an "influencer" spot, with her repeatedly passing gas as she touts the benefits of a new "supermodel shake" —before running to the bathroom. "I have only been taking it for three days, and I've already lost 35 pounds, and I've got abs but I've never done a day's exercise in my life," she says in the video, which has been viewed over 1.3 million times on Twitter. Jamil posted the video after weeks of calling out the likes of the Kardashian sisters and rapper Cardi B for promoting supposedly stomach-flattening "detox" teas and shakes on their social media accounts. "Give us the discount codes to your nutritionists, personal chefs, personal trainers, airbrushers and plastic surgeons you bloody liars," she said in one post targeting promos by Iggy Azalea, Khloe Kardashian and others. She also charged that such products aren't effective or healthy, something some doctors have done as well. "I was the teenager who starved herself for years, who spent all her money on these miracle cures and laxatives and tips from celebrities on how to maintain a weight that was lower than what my body wanted it to be. I was sick, I have had digestion and metabolism problems for life," she tweeted to her 445,000 followers last week. Jamil took special aim at a post by Cardi B over the weekend, saying she's "on the laxative nonsense 'detox' tea" and wishing that she and other celebs would have public accidents in their pants "the way the poor women who buy this nonsense upon their recommendation do." The rapper's post included a discount code for her 36 million Instagram followers, but wasn't identified as an ad or sponsored content. Kristen Strader of the consumer advocacy group Public Citizen said that's a problem. "With traditional advertising — television and print — we know we’re being advertised to. Consumers can use the appropriate filters. We know they want us to buy a product. With influence marketing, when an endorsement is not disclosed, people can't use the same filters," Strader said. The Federal Trade Commission has started tackling the issue. Last year, the agency sent letters to 90 unidentified "social media influencers" warning them to make sure sponsored content is clearly and properly labeled as such. "If there is a 'material connection' between an endorser and the marketer of a product — in other words, a connection that might affect the weight or credibility that consumers give the endorsement — that connection should be clearly and conspicuously disclosed," the letters read. "Material connections could consist of a business or family relationship, monetary payment, or the provision of free products to the endorser." The agency has yet to file any complaints against individual celebrities, but it has gone after companies it says have engaged in deceptive practices by failing to disclose payments to "influencers." In 2016, the FTC settled a case against Lord & Taylor for an ad campaign that allegedly included sending dresses and between $1,000 and $4,000 to "50 select fashion influencers" who then posted pictures of the dresses on Instagram while tagging the store. The posts were also pre-approved by the chain. None of the posts "included a disclosure that the influencer had received the dress for free, that she had been compensated for the post, or that the post was a part of a Lord & Taylor advertising campaign," the FTC complaint said. And earlier this month, the federal agency settled a case against another company that allegedly misrepresented a paid endorsement. The public relations firm Creaxion promoted a new insect repellent during the Zika outbreak in Brazil before the summer Olympic games by hiring two American gymnasts, Jake Dalton and Carly Patterson Caldwell, to endorse the product. Each "received several thousand dollars for their activities," and posted social media endorsements without disclosing they were paid, the FTC complaint in the case says. "I love the smell & love that it’s all organic & safe! I’m a buffet for mosquitoes so this is a game changer!" one of Patterson Caldwell's Instagram posts said. The settlements in both cases did not carry any retroactive fines, but said the companies could be fined tens of thousands of dollars for future violations. But Public Citizen's Strader urges the FTC to be even more aggressive with increasingly pervasive marketing technique. "The FTC needs to do a lot more to change the culture around influencer marketing. Otherwise it won't change," she said, calling for "actual enforcement actions that come with a fine." Jamil, meanwhile, is continuing to go after the influencers themselves. "Generally just don't ever take diet advice from women who know nothing about nutrition/basic advertising ethics. IF you want to get healthier, talk to a trainer/doctor," she tweeted.